The New Year is a bittersweet reminder of what was left undone and lessons learned. The New Year is the beginning of new things to learn, expected and unexpected situations. Happy New Year to everyone. I wish for your endings to be positive and your beginnings to be courageous. 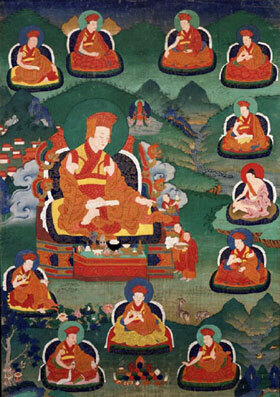 Lojong was originally brought to Tibet by an Indian Buddhist teacher named Atisha. It is a mind training practice in the Tibetan Buddhist tradition and is based on a set of aphorisms formulated in Tibet in the 12th century by Geshe Chekhawa. The practice involves refining and purifying one’s motivations and attitudes. The 59 proverbs that form the root text of the mind training practice are designed as a set of antidotes to undesired mental habits that cause suffering. Wishing you and yours a fantastic and transformative 2016. Living in the Dark Ages – Almost. My fourteen year old computer died a quick and painless death about five weeks ago. Since then I had been thrown back into the dark ages of no computer. I say almost because I used my phone as much as possible but it was difficult. So I borrowed lap tops and went to the library barely getting my emails answered. Thankfully, I now have a new one. It zips and flies and speeds all over the world-wide web. I am so relieved. This now my chance to catch up with the rest of the world.